EUROPE - email for details! 20019/20 will be my 20th year of running these classes - I think I'm quite good at them now! ALL THE CLASSES ARE RUN DURING THE AUTUMN AND WINTER and are booked up well in advance! The dates for the next set this autumn ARE NOW AVAILABLE TO BOOK BELOW!! Please note that the classes can ONLY be attended by advance booking! I am never short of people wanting to come so please don't leave it too late - I can't hold dates for you without payment I'm afraid. Last year all the dates were fully booked by the end of JUNE so please don't leave it too late if you are thinking of booking. I try to update the lists of available dates each day but if I get several bookings for the same class on one day then I might have to ask you to change your date - you can leave an alternative date in the text box for technical instructions on the order form if you wish to. Classes are only run in the autumn and winter - there are NO SUMMER CLASSES! Buy your friend or loved one a place on a stick-making class - or simply treat yourself! A class makes a wonderful surprise present. This is not negotiable - in the past I've been too soft and refunded people who couldn't attend for one reason or another but I'm left out of pocket through no fault of my own! If you have to change the date of a class (after we have confirmed it with you) it may be possible - but only if we can allocate the place to someone else. In the event of a refund being made we will withhold a £5 admin fee to cover postage, extra time spent and our bank charges. * If severe winter weather is forecast please contact me a few days before the class is due so we can rearrange a date. I've only had to do this twice but it's better than risking problems caused by driving in deep snow. If you prefer to buy Gift Vouchers for a friend to spend for themselves then click the link. Please be aware though - I don't know the dates of classes until they are worked out and published here. 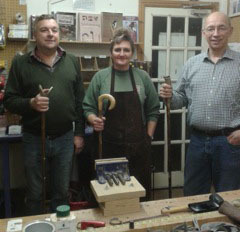 A one day class in the basic skills involved in making your own sticks. No experience needed but minimum age is 18 (because of insurance limitations). Most of the people who come have never made a stick before - but everyone goes home with a complete stick they have made! Anyone with a bit of stickmaking knowledge who would like to improve and learn some new tricks is also welcome. The format of the class is really simple - I show you how to do something, then watch you do it on your own so you really do make the complete stick on the day! If you need more advice - I'm here to help as much as you need. 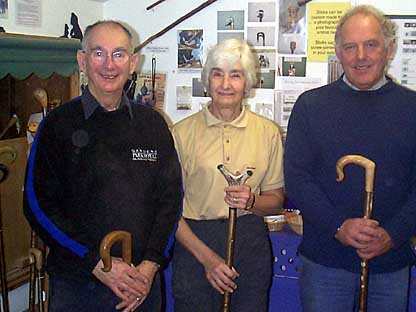 Everyone who attends learns how to straighten a stick, make a "proper" traditional peg joint to fix the handle to the shank and use standard hand tools to work the handle and shank to a finished stage. No power tools are used by students - all sawing and drilling is done before the class. There is a choice of seven or eight different handle types in wood and antler to use - many people come back more than once to make different sticks. ALL MATERIALS AND TOOLS ARE PROVIDED FOR YOU ON THE DAY. FREE LUNCH AND REFRESHMENTS ARE PROVIDED TOO (if required) SO YOU ONLY NEED TO BRING YOURSELF. Classes start at 9.00am and finish around 4.30 to 5pm. We hold the classes in my heated workshop and have use of the toilets at the Walled Garden very close by. If you get held up on the day for any reason then try and let me know, if you're a little bit late we can make up some lost time and still get finished. Maximum of Three people only in each class. Price is £150 per person inc. VAT. All materials and use of tools are included in the price. A free lunch, usually of sandwiches, pie, crisps and cake is provided. If you prefer to bring your own please let us know in advance. If you have any special dietary requirements I suggest you bring your own lunch as we can't guarantee to fulfil your needs. Coffee and tea is provided at frequent intervals. You will receive an automated provisional receipt of the class booking before we have chance to physically check that a place is available for you - so I strongly suggest that you wait until we have confirmed your booking by post before you make any plans or pay for any accommodation! If you would prefer traditional Farmhouse B&B you might like to try Carr House Farm just a few miles away near Ampleforth. I have negotiated a superb accommodation discount of 10% for all my class students with each of the above establishments so please be sure to inform them that you are attending a class and ask for the discount at the time of booking. If you don't receive confirmation of a place BY POST within a week of making the booking then YOU MUST contact us to check the situation! Paper confirmation overrides any email receipt - which may have to have a day or name changed if you update your booking. When I arrived home last night I was greeted by 3 little people enthusiastic to see my 'efforts' and a wife who was thrilled with the end product. I thoroughly enjoyed the day and would like to thank you for your patience, sharing of knowledge and opportunity to learn a lovely skill which I hope to improve in time. It was one of the most thoughtful presents I have ever had and I found the day to be very therapeutic indeed (perhaps slightly different from your perspective!!). I now have the confidence and desire to learn and do more. There will be use of the website in time I hope for placing orders. Great to have a laugh over LJS etc. Thank you for a fabulous day and for your kind hospitality. If you are interested in other arts and crafts courses in North Yorkshire then I can thoroughly recommend http://artison.co.uk/ from personal experience! ArtisOn is held about 40 minutes drive away from Helmsley so maybe your spouse or partner could go there while you enjoy a stickmaking class here?